St. Johns Wort is a perennial flowering plant native to many parts of Europe and the U.S. It has been used for centuries for its pharmacologic properties in fighting depression, insomnia and anxiety, and for promoting weight loss. Like valerian and other herbal remedies with long histories of effective use and applications, the use of St. Johns Wort is widespread. A number of clinical trials have also underscored its pharmacologic usefulness, adding oomph to dietary supplement sales. Fact: Insomnia and depression share a close connection. Most depression sufferers report insomnia among their symptoms and for this reason insomnia is most usually a secondary symptom of other medical maladies, commonly depression. But given St. John’s Wort’s unique depression-fighting benefits, it also is very useful in beating back insomnia symptoms. 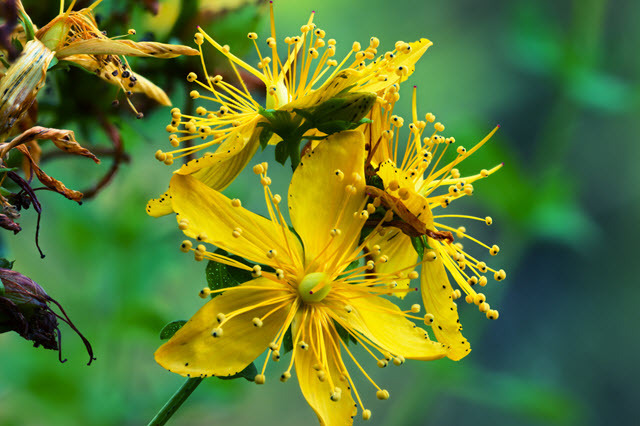 The mechanism of action in St. Johns Wort, aka Hypericum, remains elusive, but most studies indicate a number of compounds in the plant could play significant roles as anti-depressants as well as sleep aids. St. Johns Wort may stimulate the GABA receptor, a key gateway for sleep-inducing chemicals in the brain. St. Johns Wort may provide stimulus for the production of serotonin or limit serotonin reuptake similar to some of the common anti-depressants on the market currently. Various studies on the use and effectiveness of St. Johns Wort have been conducted over the years with varying results, but user benefits may be most valuable. St. Johns Wort as a supplement should not be taken as a replacement for physician-prescribed medications. There are some risks associated with St. Johns Wort especially when taken in combination with other medications, particular MAOI inhibitors and other drugs and supplements that increase serotonin. Large doses of serotonin could lead to serotonin syndrome or toxicity. Taken according ot package directions and in consideration of other medications many people have reaped good results from St. Johns Wort. The supplement is not only used for insomnia and depression, but also for weight loss and anxiety.